The Verizon New York City Triathlon is one of the nations premier urban triathlons, with a course that wraps through some of the busiest streets in Manhattan. 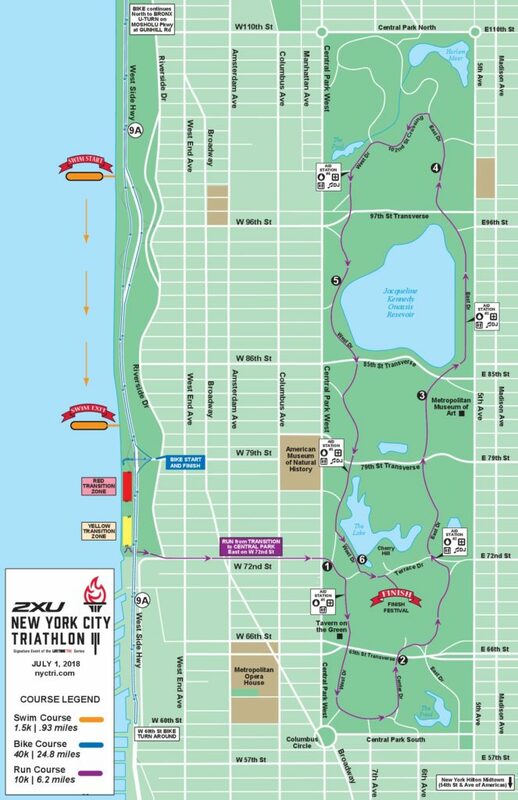 This epic race includes a 1.5k swim with the fast current in the Hudson River, a 40k ride up the traffic-free Hudson Parkway into the Bronx and back, followed by a 10k trek across 72nd St before conquering relentless hills and finishing in the heart of Central Park. 11:00 a.m. – 2:00 p.m.	Bike Check-Out - Athletes MUST remove their bikes from Transition by 2:00 p.m. Please visit https://lifetime.givepulse.com/event/94041-2019-New-York-City-Triathlon to sign up as a volunteer for this event. How was New York City Triathlon?